Spend your days exploring the majesty of the Rockies and your nights recharging in our luxury summer vacation cabins. 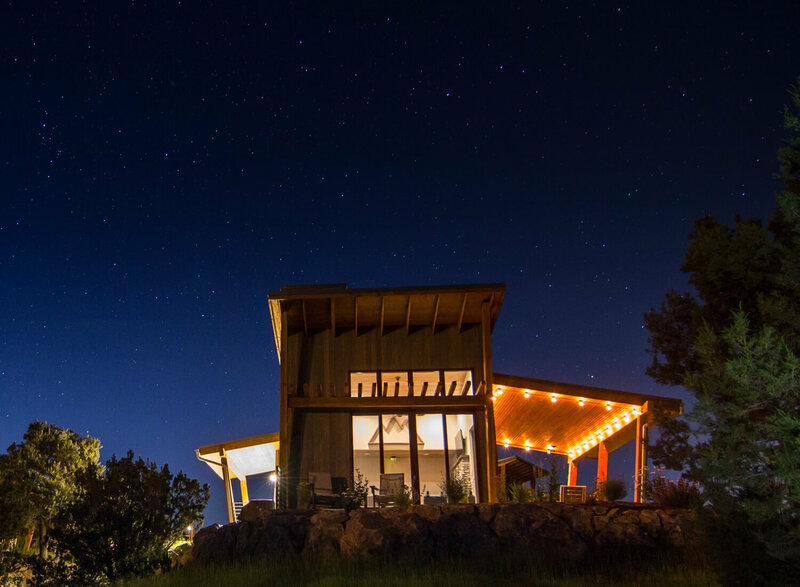 Our summer cabin rentals are a great way to enjoy the best that Colorado has to offer without sacrificing comfort. Whether you will be spending a romantic weekend in the mountains or bringing along the whole family, we have a summer cabin rental for you. We offer Single and Double King Cabins that sleep up to four adults and two children. Our cabins are located just one hour outside of Colorado Springs and just down the road from the beautiful Royal Gorge area. Here you will find yourself within a short drive from countless outdoor adventures. Summertime in the Rockies means rushing rivers, abundant fish, and amazing trails for hiking and mountain biking. Don’t miss your chance to get the most out of the gorgeous weather that summertime brings to the Colorado mountains! Simply give us a call or click check availability to book online. As you walk out onto your private porch, you will enjoy pristine mountain views in every direction. Our Single King Cabins can comfortably sleep up to 2 adults and 2 children, 4 guests, with one king bedroom and one sleeper sofa. Every room has modern amenities to make your stay comfortable, from flat-screen TVs in the bedroom and living room to unlimited WiFi and an indoor / outdoor fireplace to keep you cozy throughout the evening. Our Double King Cabins are a great option for families with two king bedrooms and one sleeper sofa in the living room. There is plenty of room for your whole family to spread out, and with flat screen TVs, cable, and WiFi in each room, there will be no need to fight over the remote! You can spend the evening underneath a canopy of twinkling stars while enjoying the pass-through fireplace that will keep you warm and cozy whether on your private patio or while watching a movie in the living room. You will find a kitchenette for whipping up your family’s favorite meals, or you can take the night off and head to the 8 Mile Bar and Grill that is just across the street, where we can make the delicious fare for you. Our Single and Double King cabins are available 365 days each year. Summer is a popular season for families and couples coming to the Colorado Rockies from Colorado and the surrounding states, so be sure to plan your lodging before it sells out. Our pricing and minimum night stays vary depending on demand. What Can You Expect from Your Vacation? When you’re not at your Colorado summer cabin rental, there are endless activities and adventures to enjoy. Our cabins are located a short drive from the Royal Gorge, one of the top outdoor recreation locations in the state. Spend your days splashing down canyons as you paddle through wave after wave on a rafting adventure. The Arkansas River offers some of the best rafting in the US, with trips suitable for extreme adventurers and first-time rafters alike. For a relaxing day, enjoy a scenic ride along the Arkansas River aboard the Royal Gorge Route Railroad. You will find local fare freshly made on board as you sip wine and take in the local scenery. Zip-Lining: The highest zipline in America soars over the Royal Gorge itself. Gold Metal Fishing: If you enjoy fishing, the Arkansas Rivers is one of the best spots in the State. Mountain Biking: There are countless trails all around us, including over 15 miles of new trails in the Royal Gorge Park area, just 5 minutes from your cabin. Gondola Rides: The Royal Gorge gondola offers 360-degree views as you transverse one of the deepest gorges in the country. This is only a handful of the activities that the Colorado mountains have to offer. If you need any help planning your dream vacation, give us a call and our experienced staff can let you in on the best that the area has to offer.